Casual, cool and just a little bit different, the Manometro by Giuliano Mazzuoli has been the centerpiece of the Mazzuoli collection since its debut in 2005. While it has spawned a number of variations, over that time the Manometro has remained faithful to the original because when a design is just right, there’s little to be gained in trying to improve on it. And so for its tenth anniversary in 2015 the brand created a limited edition of just 120 numbered pieces with a few little special features to celebrate the occasion. An uncomplicated but visually striking watch the Manometro has a load of character, which has earned it a cult following, and a popular addition to the collections of the most discerning collectors. A fabulous looking combination of outgoing Italian design, complemented with the gravitas of a high-quality Swiss movement, it’s a piece that’s always fun to wear. Its design is inspired by an engineer’s handheld analog pressure gauge and with these influences evident throughout, it has a style all of its own. 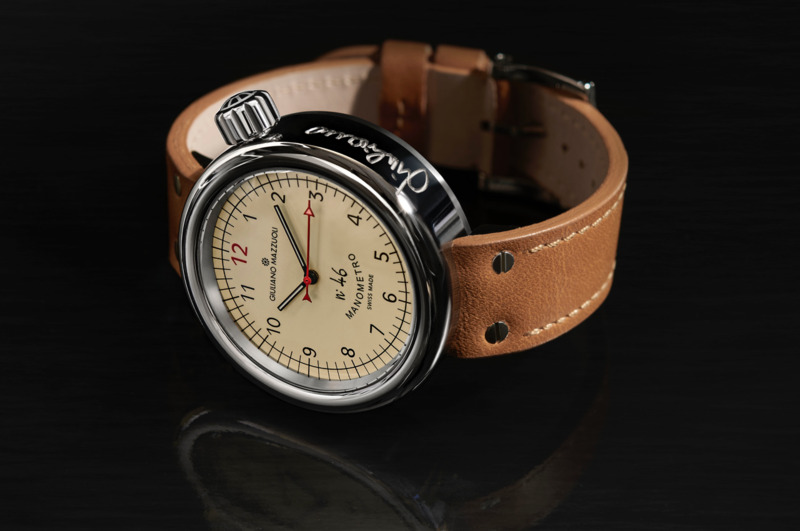 Flat-sided, it has no lugs, as the calfskin leather strap is seated within the 45. 2mm stainless steel case, so it is perfectly round. Its no-frills, one-piece design means that the rounded bezel is seamlessly integrated into the shape of the case, and the effect is set off by the pronounced crown which, like the actuator on a hand gauge, is positioned at the 2 o’clock position. Just below the level of the bezel, the flat sapphire crystal is sunken, and beneath it the ivory colored dial has the edition number applied by hand. Featuring gauge like markings and straight black hands with luminous accents, it’s a simple but very effective layout, providing excellent legibility, and the red seconds hand with lumed arrow tip is just like the pointer on an engineer’s instrument. The case is finished in a high polish and on its side the Italian designer’s signature is inscribed on this anniversary model. Behind the screwed down steel case back beats a Swiss ETA self-winding movement which runs at 28’800 vph and boasts a power reserve of 42 hours.